There is comfort in the familiar. There is comfort in understanding a certain feeling, but there is also peace in being able to give up control. Giving up control might not always be comforting though. It is the amalgamation of the familiar, the unsettling, the insecure, and the eventual calming notions that ultimately make the tone of Midnight Special one we find both comforting and grandly mysterious. Both soothing and simultaneously unnerving. In essence, director Jeff Nichols latest is all about tone. Were it not for the tone of a late seventies/early eighties mesh of John Carpenter and Steven Spielberg it would be difficult to contemplate what exactly Nichols was attempting to say with this film. Instead, every aesthetic choice helps to inform the interpreted meaning behind the narrative. Without the score from David Wingo or the cinematography by Adam Stone (both who have worked numerous times before with Nichols) the emphasis on the juxtaposition between the mundane world of the southern region of the U.S. and the magic of Alton Meyer (Jaeden Lieberher of St. Vincent) would be lost. The somewhat arrested progression of architecture and the numerous cracks in the freeways combined with the tired areas of suburbia and run-down motels our protagonists venture to throughout all possess that strangely comforting feeling of being lived in and yet the reasons these characters venture so quickly through these places is of uncertain consequence. Why they feel the need to put cardboard on all of the windows in whatever domain they enter or who exactly this young boy is and why he's so strikingly different from the rest of us is anyone's guess. Nichols, who also penned the screenplay, layers on the mysteries one after another for much of the film delivering one unexpected turn after another with just the right amount of answers to the countless questions that pop up. These elements of tone and style, story and emotion come together and go hand in hand to create a damn near perfect film that is too nuanced to be about one thing in particular, but rather has the rare ability to convey different yet subtle shades of meaning to each individual in the audience. 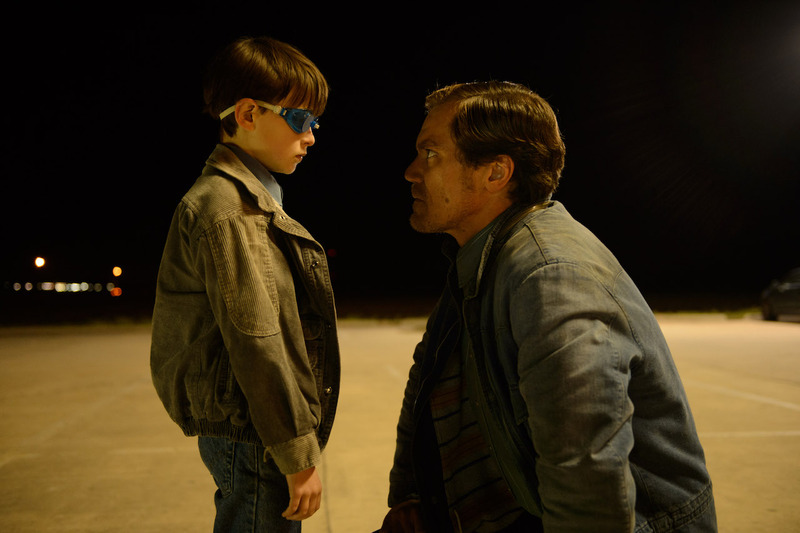 Alton Meyer (Jaeden Lieberher) and his father Roy (Michael Shannon) are on the run in Midnight Special. So, what exactly is Midnight Special about? It's difficult to say without getting too specific or spoiling too much of the story. It is certainly best to go into the film knowing as little about it as possible, but knowing specific story points certainly won't ruin the experience either. In all honesty, the film isn't really as much about the story as it is the characters taking part in it and it is in this regard that the movie is not just relaying a certain sequence of events, but is actually about something. 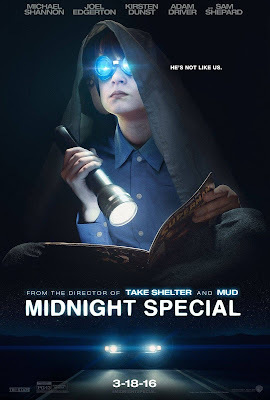 The trick is, I suspect Midnight Special will mean different things to different people depending on what point they happen to be at in their lives when first experiencing it. This is true of any film to a certain extent, but it is not one of the objectives of most films. With Midnight Special it seems Nichols is intent on having the plot be interpretive to the point of a viewer being able to draw meaning out of any one aspect and applying it to their life however they wish. For this particular viewer, who is new to parenthood and finding himself all the more affected by films and stories dealing with parental figures and their unconditional, undying love for their children Midnight Special is about the inherent deal between parent and child that comes with bringing life into this world no matter the challenges/surprises that life may bring with it. It is difficult to imagine for anyone who has not been through such an experience as having a hand in creating a life and then seeing that life begin to resemble a living, breathing person with a personality, but it is this connection that kept the whole of Midnight Special so vital and so moving for me. I wouldn't have bought into this aspect two years ago, but more would have focused on the coolness of certain shot choices that pair perfectly with Wingo's score to really elicit the films from which Nichols is clearly drawing inspiration, but that is what makes Midnight Special such an exceptional film; it has the cool factor in spades and yet it drives home the impact and repercussions of the actions taking place rather than simply having these actions take place because they fit well with the stylized manner Nichols desired. To accomplish such tasks, Nichols first needed the right amount of talent in his players to be able to play these subtleties. His frequent collaborator in Michael Shannon was something of a given as Shannon has appeared in all four of Nichols feature films (all five if you count the upcoming Loving), but the best part about this lasting relationship between the actor and director is the idea Nichols knows Shannon well enough to not typecast him. Shannon has come to embody the crazy/evil persona over the past few years and he's had no small part in making that true. From Revolutionary Road up through Man of Steel Shannon has somewhat honed that facade, but here his portrayal couldn't be further from such types. In Special, Shannon is a father, unsure of what to do or what course of action might be the right one to take, but he is a father who trusts in his son and will go to the ends of the earth to make sure he is safe and where he needs to be in order to thrive. By the time the film comes around to its conclusion it actually doesn't seem as if Shannon has had many lines of dialogue (though this by no means feels intentional or as part of an experiment by the filmmakers or Shannon) and yet we feel we know Roy and his sensibilities well enough to trust our interpretations. Given the apparent leanness of the actual script there is a lot of room for interpretation and Shannon takes advantage of this by lending his father figure a sympathetic sternness that always emanates a compassion despite being in the midst of stressful, sometimes intensely confusing situations. Lieberher is again impressive here as he plays against the precedent his first major role set-up. Much of his performance is also conveyed in the looks and body language of the young boy rather than through dialogue. The challenge was going to be to make Alton agreeably extraordinary without being precocious. The audience needed to believe that Alton was worth all of the trouble his father and Lucas (Joel Edgerton) were putting themselves through and Lieberher is able to give Alton the right balance of assuredness and certainty without coming across as arrogant or insane. Edgerton and Adam Driver are especially noteworthy as they bring both complexity and humor to characters who are each in over their heads to a certain degree. Kirsten Dunst, while being somewhat sidelined in the bigger picture, has a particularly interesting arc to play given we can pull out the context of her characters situation and assume the strides she's had to make to get to where she is presently. It is in the films ability to not only allow the actors to fill in the blanks, but the audience as well that makes it fulfilling-both preserving the sense of mystery around the film while allowing viewers a sense of accomplishment that, without it, we might feel less satisfied with the resolutions the film offers. Beyond the marquee stars, Nichols also can be consistently counted on for stocking his films with a host of great character actors that make even the smallest of parts feel meaningful in their scope. The likes of Sam Shepard, Bill Camp (Love & Mercy), Paul Sparks (House of Cards), Sean Bridgers (Room), and the ultimate character actor in David Jensen each bring a unique look and twist to their personalities making the overall effect of the film that much more compelling even when some of these actors are only present for one or a handful of scenes. 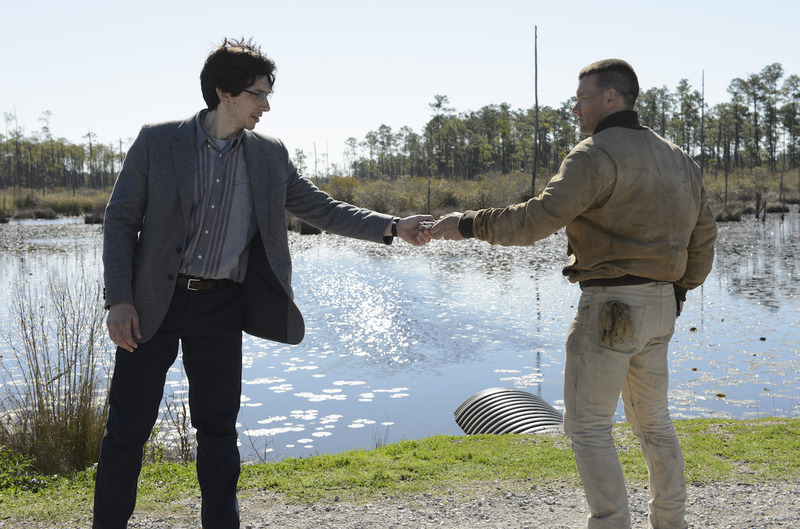 Paul Sevier (Adam Driver) and Lucas (Joel Edgerton) are cautious, but thankful with one another after the return of Alton. The most difficult thing Midnight Special was going to have to do was find an acceptable and adequate conclusion that would give audience members, no matter their interpretation of meaning along the way, a satisfying feeling regarding the mountain of mystery the movie piled up until that point. What gives Midnight Special the ability to somewhat evade this trap is that we find solace in the mystery. We find consolation not in the answers, but in the way the story is conveyed. Given the way the story is told we can trust that whatever conclusions we draw could potentially be correct in some fashion. While Nichols does tend to deliver more of an answer here than I expected he is still able to withhold enough details that the mystery, the joy of not knowing is very much left intact. The knowing will never be as fascinating as the wondering and Nichols has tapped into that psychology with this film specifically by flat out telling us that to understand the source of Alton's power is to finally understand our place in the world: something most of us would care not to learn. Likely extinguishing any idea of control we believe we have over our existence. And as we know, control is a difficult feeling to let go of. Nichols takes advantage of our penchant for ignorance when it comes to world-changing revelations and utilizes that basic human instinct to make his ambiguous and sometimes outright vague story work in his favor. Nichols plays with several ideas including religion and its hold on certain types of people in more damaging than uplifting ways, he dabbles in the control of the government with the FBI and NSA playing rather crucial roles in the film with one sequence involving a satellite whose sole purpose was to detect a nuclear event being one of the best we'll likely see on film all year. The director presents caveats within the narrative that touch on the human condition of self-soothing through extraneous material so as to ignore our deeper thoughts and desires as well as what it's like to be pulled at and demanded of because one might possess a unique talent or gift, but what all of it comes back around to is comfort. Comfort in keeping things familiar and for all intents and purposes, safe. Safe so that we might survive as long as possible, but at what cost of relinquishing our potential? Midnight Special makes us feel comfortable through the style it uses to tell its story, but after we settle in the film uses its structure, tone, pacing, and perfect escalation of the documented events to make us uneasy, but ultimately far too curious to turn back. In doing so, the experience proves to be nothing short of fascinating and strangely, even motivating.